If you are looking for a traditional Oscar-bait story of inspiration that hits all right notes, look no further than HIDDEN FIGURES. That may seem like a slight. It is most definitely not. 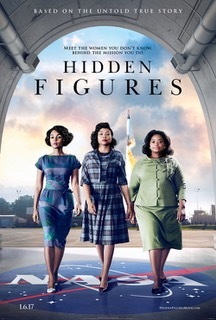 The story of three African-American women who helped propel the United States to the front of the space race is truly inspiring. It’s not easy to make a film that tells about a little known part of history and make it truly inspirational without making it eyerollingly cloying. So good job to director Theodore Melfi and screenwriters Melfi and Allison Schroeder. The succeeded where other movies have failed. There is also a danger in the telling of how three black women overcame prejudice to succeed to find a white hero (Emma Stone’s character in THE HELP is the notable example). There is none of that here. Even though Kevin Costner’s head of space operations comes close, he walks the line without jumping over it. The acting is really very good. The Golden Globe this film won for ensemble cast is truly deserved. There is not a weak link. Some standouts are Taraji P. Henson who plays Katherine G. Johnson, who winds up being the focus of the film. Octavia Spencer is just a wonderful actress in whatever she does. Her role here as Dorothy Vaughn, a woman who takes initiative and makes herself indispensable is quietly powerful. And Janelle Monae is a revelation as Mary Jackson, a woman who fights the system to follow her dream. They are three powerfully strong characters who don’t require the help of a white man, but don’t turn away from it when the hand is offered. I must admit, there were several moments in the film where I felt a catch in my throat and tears in my eyes. Maybe I’m a sap, or maybe in the current political climate this is truly inspirational. Whatever it is, HIDDEN FIGURES is marvelous entertainment.